Many years ago, on a dark and stormy night, the disfigured and enigmatic Doctor John Smith invited his closest friends, Inspector Victor Schaeffer and his wife, Jacqueline, to a dinner to celebrate his birthday. A few hours later all the occupants in that house had been changed – some were dead, others mentally scarred forever by the events of that night. So, what happened to the distinguished dinner guests on that evening? Perhaps, we’ll never know. But two clues have led to much speculation – found outside the study window, a charred umbrella with a curved red handle and found inside the house, a blood-stained copy of Stevenson’s The Strange Case of Dr Jekyll and Mr Hyde. But, for everyone else, is there no ending of this one night of Hell? Sylvester McCoy is the Doctor in Master. It’s a long held philosophical axiom that everyone has a counterpart. For some, it’s a soul mate, either as a lover or as a best friend. It could be a fraternal or identical twin, or simply a blood relative where the relationship is thicker than water. It could even be a rival, or even a full-blown nemesis, someone so despised and hated that a person’s entire life is dedicated to bettering them or seeing their world lie in absolute ruin. Now, what if a person’s counterpart fulfilled nearly every one of the criteria above? 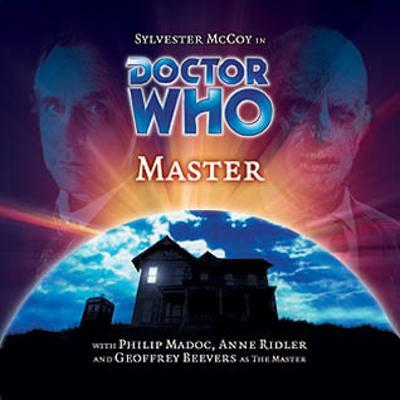 Master is the final story in Big Finish’s “Villains” trilogy, focusing on the renegade Time Lord known only as the Master, the greatest nemesis of the Doctor. Once again, the Doctor and the Master find their destinies intertwined, this time in a lonely mansion located on a desolate hill just outside a town that has been rocked by a series of grisly murders. Much like the previous serial Davros, Master sees the Seventh Doctor and the Master meditate upon the concept of evil and “nature vs nurture” as only two long time enemies can. Alas, while the first three episodes ratchet up the tension towards the climax, the big reveal in the fourth act utterly wastes the previous chapters with a “twist” that goes against the very nature of the concept of the Doctor. The Doctor’s been here before; talking to someone holding a gun. But this time, he’s not trying to talk the gunman from shooting him, but instead only wants to tell him a story while the assassin waits for his target. There once was a man who lived in a small town called Perfugium for ten years. He arrived in this town disfigured and amnesiac, with no memory of who he was and what he had done. Taking the name “John Smith,” this man became a force for good in the town, providing medical assistance and making good friends with people such as the local Adjudicator and his lovely wife. Ten years after his arrival to the day, the trio get together in Smith’s mansion, left to him in the owner’s will and rumored to be haunted. Along with the serving girl Jade, the group prepares to spend a wonderful and quiet evening together celebrating their friendship, ignoring the gruesome murders of local girls that has plagued the inspector’s mind in recent weeks. But when the wine flows and true emotions are let loose, the bonds of friendship begin to fray…and the sudden arrival of a stranger, heralded by a flash of lightning, means that before the night is over, hidden identities will be revealed and the true of nature of all within the mansion shall become evident. Much like Omega and Davros, the success of Master depends heavily on the performance of the actor in the title role. And much like Ian Collier and Terry Molloy, Geoffrey Beevers absolutely crushes it as the Master/John Smith. I’m really not giving anything away with that bit of obvious casting. From the very beginning, Beevers plays Smith as knowledgeable (something the Master is), charming (something the Master can be), and humble (something the Master is capable of faking). Anyone who knows something of the Master will find themselves thinking the same thing they did about Davros in the previous serial as they hear Beevers’ performance; can someone so full of evil possibly change their stripes? Unlike Molloy’s performance, however, where Davros spoke of his will to change and attempts to become a better being up until he tried to blow up the Doctor with a nuclear weapon, the very hints of the Master’s true personality can be heard just under the surface. A snappy answer. A moment of smug yet downplayed superiority. Flattery towards his friends. The listener is well aware that Beevers is the Master and can sense it in his performance. But the dialogue and the way Beevers delivers it tells a different story. Is this a case of the Master once again obfuscating his true nature in order to advance his nefarious scheme? Or is this a Master who has truly lost his memory, and a new personality has overwritten the old? Throughout the first half of the serial, this question dominates the proceedings. By the third episode, the truth is beginning to crystallize and the struggle begins, and Beevers sells the struggle like his life depended on it. The listener can sense the battle raging inside of him; nature vs. nurture, the past vs. the present, environment vs. history. And it’s a damn shame that the fourth episode renders all this conflict moot. Much like how only Colin Baker could have been the Doctor in Davros, Sylvester McCoy is the best Doctor to play in Master. Contemplative and eager to engage in deep philosophical conversation, this one of McCoy’s best performances with Big Finish. Much like Project: Lazarus, this is a Doctor on his own, sans companions. No Ace, no Mel, his sense of humor is much dryer, his metaphors no longer mix, and a true sense of quiet weariness; a Time Lord nearing the end of his regeneration, even if he doesn’t quite know it. In a way, the weariness makes sense considering the nature of the final episode, as if McCoy’s Doctor unconsciously knows his fate. McCoy and Beevers don’t spar as Doctor and Master usually do for much of Master’s runtime. In fact, the Doctor doesn’t even show up until the second episode. From there, however, the Doctor and Doctor John Smith keep up a running dialogue concerning various topics, including and always coming back to the nature of evil. McCoy probes and prods at the Master in a very respectful, but meaningful manner. When the menace comes out and the threats begin on all sides, McCoy’s growling accent adds to the tension, slowly raising the stakes as the final moment approaches. Again, the fourth act moves away from this and lends itself toward a lot of yelling, but up into that point, McCoy’s performance is absolutely on key. The supporting cast is small, as in a sense Master is a “base under siege” type of story, but in this case the siege comes from within. John Smith’s two friends play an important part to the story. Philip Madoc is no stranger to Doctor Who, having starred in several television serials such as The War Games and The Power of Kroll. Here, he plays Victor Schaefer, head Adjudicator for Perfugium who’s caught up with the investigation into the slaughter of several young girls of questionable repute. Much like Beevers’ portrayal of the Master, Schaefer gives off a cool, even, cultured veneer, but just under the surface something boils. When Schaefer lashes out, it’s both unexpected and chilling. Playing his wife Jacqueline is another Who returnee, this time from The Wheel in Space, Anne Ridler. A dignified lady of airs who spends her time assisting the less fortunate, Jacqueline shows a vicious streak towards the serving girl in episode one and a willingness to push the envelope in episode three. Ridler shines in the roll as wife to Victor while pining for Dr. Smith at the same time. The serving girl Jade, whose role in the proceedings becomes more vital as the story progresses, is played by Big Finish veteran Charlie Hayes. As both a meek serving girl and then in her much bigger part during the climax, Hayes is solid early on, but becomes a bit over the top during the final act, though it is a very subtle, quiet sort of over the top as opposed to chewing the scenery. And a bit of praise should go to Daniel Barzotti, who plays the gunman that the Doctor tells this tale to. He’s very wry and possesses a gallows sense of humor that makes the transitions scenes involving him enjoyable instead of jarring. The script for Master was written by Joseph Lidster, who’s written highly received serials in The Reaping and The Gathering, but also some very poor ones such as The Rapture and Terror Firma. The Rapture, which I reviewed earlier, suffered from a very heavy-handed script with its anti-drug message and poor characterization throughout its supporting cast. However, that audio did sport some superb sound production, a trend that continues in Master. The stage is set for a lonely house on a hill, with the thunder and lightning outside mixed with the clink of silverware and wine glasses inside. Throw in howling wind, whispering voices, and the occasional blood curdling scream, and this story, on a purely audio level, comes off as if Philip Hinchcliffe took a pass at Ghost Light. The entire story takes place in the same house as an oncoming storm keeps the characters inside. Master is definitely the slowest-paced audio Big Finish has done so far. The large majority of the play’s run time focuses on conversations between the characters. As I mentioned earlier, the Doctor doesn’t even show up until the second episode, meaning the entirety of the first episode focuses on building the relationship between John Smith/the Master, Victor, and Jacqueline. While some listeners might decry the slow pace and long lead-up, other listeners may appreciate the time Lidster spends on characterization this time out. The whole first episode, we’re left wondering what the Master is truly up to. There’s no mention of the Doctor, no sign of the Doctor…is this a long con, or has the Master truly lost his memories? …and then the play runs head on smack into the big reveal in the fourth episode and derails like a Welsh train in a high wind. The “little reveal” at the opening of the fourth episode is done well. It’s something that a listener will either pick up on very early on in the story, or will see them going “oh, THAT’S why I should have picked it up earlier in the story.” But it’s the big reveal that absolutely wrecks everything that’s come before. All the work at characterization, all the slow tension coming to a rolling boil, the discussions about what makes one truly evil, the big reveal takes off of that, rolls it up nice and tight, and chucks it into the night without a second though. Lidster falls into the same trap that Nev Fountain did with Omega. Both writers attempt to define the villain’s methodology and put their own imprint on the character. In the case of Fountain, it was to show that for all the bad things he has done, Omega has performed acts of good, while the Doctor, in the course of saving th day, has unintentionally done harm. Lidster takes it further with Master, solving the definitive question that has always been hanging in the air between the Master and the Doctor throughout their confrontations. Were they always rivals? Were they once friends? Maybe even, as some have suggested, brothers? Fountain gives the answer, but then renders the whole thing moot with an action taken by one of them, and then another, more horrific action taken by the same Time Lord later that evening. On its own, the big reveal might hold weight, in an attempt to show that the Doctor is not always the Champion for Time and the Master is not always the Servant of Death. McCoy, to his credit, tries to sell the moment, breaking down as the truth comes out and Beevers’ Master rages at the decision, a decision he does not remember making or seeing made! 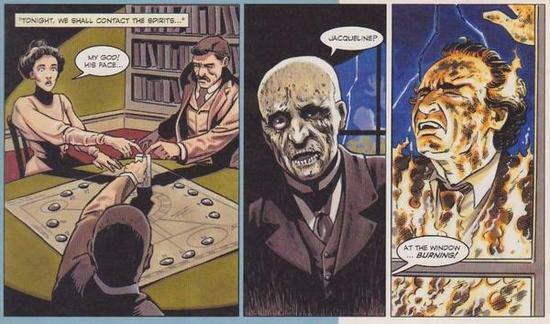 In a way, the parameters surrounding the decision and its outcome (and the effects of that outcome on the final denouement of Master) will haunt the Seventh Doctor to the end of his regeneration, and might explain his undignified end at the hands of several bullets and a surgeon trying to do her best. But the major problem comes that the big reveal goes against the very nature of the Doctor. The big reveal states that the Master and the Doctor left Gallifrey because of the decision’s ramifications, and they both have spent their entire lives dealing with the consequences. But here’s the thing – that’s not why the Doctor left Gallifrey. In fact, it’s outright stated from the time of the First Doctor all the way to Twelve’s travels that the Doctor left Gallifrey because he did not like the stuffy, stagnated society and wanted to explore the galaxy. The Doctor’s wanderlust has ALWAYS been at the center of the show, as seen by his grudging returns to Gallifrey throughout the classic series. As for the Master, The Sound of Drums reveals why he left Gallifrey; madness at staring into the Untempered Schism. After all, what is Rule #1? The Doctor lies. Next up – The three incarnations of the Doctor must join together to set time back on the right track – but in doing so, will they unleash a still greater threat? Peter Davison is the Doctor, and Colin Baker is the Doctor, and Sylvester McCoy is the Doctor in…The Sirens of Time. This entry was posted in Big Finish Review and tagged 3/5, Big Finish, Doctor Who, Master, Seventh Doctor, Sylvester McCoy, the Master. Bookmark the permalink. I so totally agree: this was a great story… until it tried to get all mythological.